Unexpectedly I was away from home for 2 weeks. I have had no internet access and no paints! Gosh did I miss them. However I did have my coloured pencils and a large sketch pad. Today, I will show you two drawings for a long overdue commission and as they have faces I will count them in the 29 faces challenge! I have some more and I will post them in the next couple of days as I am short of time today, lots to catch up on! This is about Sarah and her joy at the arrival of Isaac S, she was in her 90’s! (Gen 21) with Ishmael looking on. Eve of course! Here is the nasty serpent trying to tempt her. 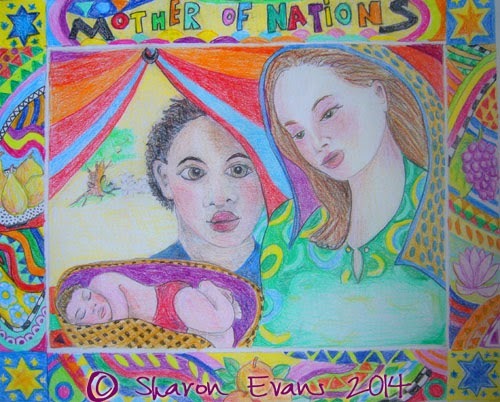 As you might have guessed the commission is for a series on Woman of the Bible for children. The blank spaces afre for the text. Have a good weekend. Hopefully I will be back to normal production from now. Linking to Paint Party Friday do go and visit all the other wonderful artists! Beautiful - you get such color from your pencils! Happy PPF! welcome back, wonderful collection of faces for this week! I love, love, love what you've done with these 2 important women of the Bible. Blessings! Beautiful! And what gorgeous colours too. Wonderful colour combinations, Sharon. I like how the borders nicely frame your pieces. It is so much fun to look at all of your details. these are lovely Sharon. I love all the details and colors. 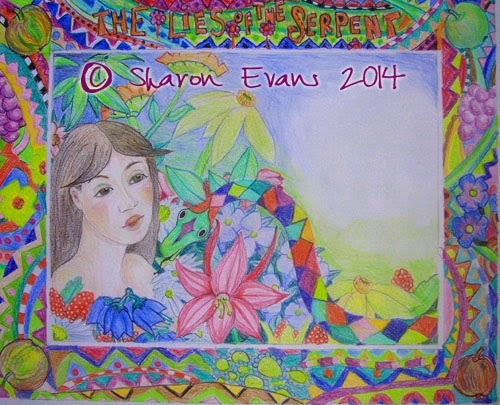 I love your colourful drawings Sharon, and especially the border surrounding it. Beautiful! these are such beautiful colorful paintings-the borders are fabulous! Beautiful. I especially like the border! Both artworks are awesome. Love the colorful and the cute details. As always beautiful work Sharon...such a joy to visit...you were missed! Oh my goodness - these are wonderful works - love all the color. That serpent is amazing! What a beautiful painting of Sarah, full of such mother-love. The colours are gorgeous. A happy painting showing her joy. And exquisite the way you have painted Eve surrounded by all the lovely flowers of Paradise. I absolutely love how colorful your drawings and paintings are!